GARCIA-NAVARRO: Joining us as always is Will Shortz. He's puzzle editor of The New York Times and WEEKEND EDITION's puzzlemaster. Good morning, Will. GARCIA-NAVARRO: So what was last week's challenge? SHORTZ: Yeah, It came from listener Roger Barkan of Savage, Md. I said, I'm thinking of a well-known U.S. natural landmark. Take the two-word name of its location. Then change the first letter of the second word to the immediately previous letter of the alphabet. And you'll get another description of the landmark's location. What's the landmark? And what are the two descriptions of its location? Well, the answer is La Brea, as in the Tar Pits. Change the B to an A, and you get LA area. And I want to acknowledge a listener wrote in to point out that the puzzle isn't exactly correct. While La Brea is a neighborhood in Los Angeles and the La Brea Tar Pits are in LA, the tar pits are actually just outside the - that neighborhood. So I wanted to say that. GARCIA-NAVARRO: Well, we received only 92 responses because it was pretty hard. And our winner this week is Tracy Starr. And not surprisingly, she is from California - Oakland, in this case. Congratulations, and welcome to the program. TRACY STARR: Thank you, Lulu. GARCIA-NAVARRO: How'd you solve it? STARR: Well, I played that puzzle with my husband, Milo (ph). We started off with a registry of natural landmarks and had very little success. But I also love paleontology and rockhounding. So La Brea Tar Pits came to mind. And we realized Brea could become area. And we knew we had it. GARCIA-NAVARRO: That sounds good. All right, what do you do for a living? STARR: Well, I worked for many years in the event space. But I'm currently spending my days as an artist at Arc Gallery in San Francisco. GARCIA-NAVARRO: Oh, fantastic. All right, so you mentioned that you are interested in paleontology. Have you found anything cool? STARR: Yeah. Actually, the coolest fossil that I've found to date is a 35-million-year-old whale bone vertebrae. GARCIA-NAVARRO: Oh, wow. That's amazing. Where'd you find that? STARR: It's a - coastlines in California. GARCIA-NAVARRO: Cool, all right, well, are you ready to play The Puzzle? STARR: I'm going to give it my best shot. GARCIA-NAVARRO: (Laughter) OK. Take it away, Will. SHORTZ: All right, Tracy, every answer today is a word that has the accented syllable TOR somewhere inside it. For example, if I said 1946 Hitchcock film, you would say "Notorious." GARCIA-NAVARRO: Which is my favorite film. SHORTZ: OK, TOR is always in the middle. And here's number one - winning. SHORTZ: Victorious, good. Number two, someone who studies the past. SHORTZ: That's it. What an exclamation point stands for in mathematics. STARR: You lost me on that one. SHORTZ: OK. It's factorial. It's a math one. All right, try this. A class for one person or a very small group. SHORTZ: That's it. Newspaper piece that expresses an opinion. SHORTZ: Uh-huh. Fill in the blank. Blank Guinea. It's a country in Africa. SHORTZ: No, it has to have TOR in it. SHORTZ: And it's in Africa. And it's right along the line that separates the Northern and Southern Hemispheres. There's your hint. GARCIA-NAVARRO: What is that line called? STARR: The equator - Equatorial? SHORTZ: Equatorial Guinea is it. Try this. Act of twisting something out of its natural shape. SHORTZ: There's actually two possible answers. But the better one, I think, starts with D, as in dog. SHORTZ: I'll give you that, contortion. And distortion also works. How about a musical work for an orchestra? SHORTZ: Starts with an O. And what if I said it starts OR? SHORTZ: That's it - oratorio. You got it. You know more than you think you know. SHORTZ: How about one of the capitals of South Africa? It starts with P, as in Peter. STARR: I don't know geography. SHORTZ: All right, I'll tell you this one. It's Pretoria. How about long-serving British queen of the 19th century? SHORTZ: That's it. A facility for recovering one's health? SHORTZ: Right. And this would be a place that - where you would do rehabilitation. GARCIA-NAVARRO: It means cure in Spanish - sana. SHORTZ: There you go. There's your prefix. SHORTZ: There you go - sanatorium. Yeah. How about a place in school to have a convocation? SHORTZ: Auditorium is it. And your last one, it's a student with the second-highest grade point average in a graduating class. SHORTZ: That's the number one, but I'm going to give you the answer. It's actually a salutatorian is the number two. GARCIA-NAVARRO: That's hard. Nobody knows who the second person is. I didn't even know they had a name. STARR: I feel great. That was a lot of fun. Thank you so much. GARCIA-NAVARRO: Oh, good, I'm glad. Well, for playing our puzzle today, you'll get a WEEKEND EDITION lapel pin as well as puzzle books and games. You can read all about it at npr.org/puzzle. And which member station do you listen to? GARCIA-NAVARRO: Tracy Starr of Oakland, Calif., Thank you for playing The Puzzle. STARR: Thank you. Have a great day. GARCIA-NAVARRO: Yeah, you, too. All right, Will, tell us next week's challenge. SHORTZ: Yes, it comes from listener Alan Hochbaum of Dunwoody, Ga. Name a popular restaurant chain in two words. Its letters can be rearranged to spell some things to eat and some things to drink. And both things are plural words. What are they, and what's the chain? So again, popular restaurant chain, two words. Rearrange the letters to spell some things to eat and some things to drink. And both these things are plural words. What's the chain, and what are the things? GARCIA-NAVARRO: When you have the answer, go to our website, npr.org/puzzle, and click on the Submit Your Answer link. Remember, just one entry per person please. Our deadline for entries is Thursday, March 7, at 3 p.m. Eastern. Include a phone number where we can reach you at about that time. And if you're the winner, we'll give you a call. 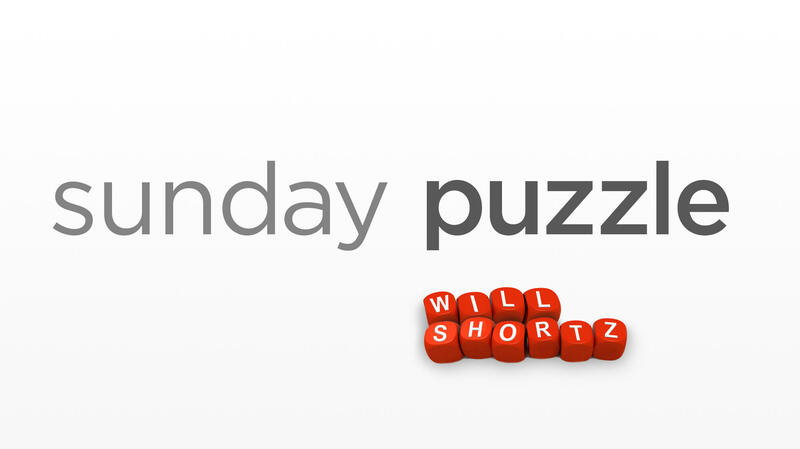 And you'll get to play on the air with the puzzle editor of The New York Times and WEEKEND EDITION's puzzlemaster Will Shortz. Thanks so much, Will.